"Our Iraqi and Syrian partners are sacrificing not only for their own countries, but for the region and the rest of the world as well," says Lt. Gen. Stephen Townsend, the American commander as U.S. forces help Iraqi troops in Mosul. Lt. Gen. Stephen Townsend meets with U.S. forces in Mosul, Iraq. The war against ISIS is entering a tough new phase, as Iraqi fighters with growing U.S. assistance push into western Mosul, warns the senior American commander in Iraq, Lt. Gen. Stephen J. Townsend. "ISIS is a brutal, brutal enemy," said Townsend, speaking in Erbil as Iraq's security forces were about to attack Mosul's airport with help from the U.S.-led anti-ISIS coalition. He said west Mosul will be more complex and challenging than the eastern side of the city, which was retaken from the extremists in four months. ISIS has its command center on the west side, along with stores of rockets and car bombs — and an urban geographical advantage. "The old town of Mosul has the most ancient construction, and the narrowest winding streets," said Townsend. Iraqi forces will be unable to move combat vehicles in the warren, and the coalition will find it difficult to conduct airstrikes without hitting civilians. As the deadline nears for a new plan on ISIS that President Trump asked his advisors to prepare, Townsend painted a somber picture of the battle against the extremists in Iraq and in neighboring Syria, where the coalition also operates. He said ISIS still holds a little more than half the territory it has taken in Iraq since grabbing control of large parts of the country in 2014. And although he said U.S.-backed troops are moving closer to the ISIS-held city of Raqqa in Syria, he conceded it is not clear who will actually move to take the city. 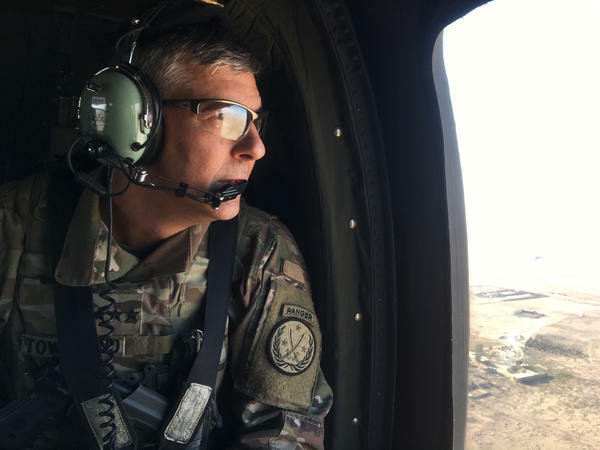 As fighting in Mosul gears up again, Townsend visited U.S. troops near the front lines, some of about 450 of soldiers from the coalition. In a significant shift in tactics, the international forces are now more deeply embedded with their Iraqi counterparts around Mosul, part of an effort to reduce casualties and speed the campaign. Leaping out of a Black Hawk helicopter, Townsend ran to meet officials at a federal police base at Hammam Alil, a village south of Mosul once known for its swimming hole. Now it has become a staging post for troops moving on ISIS. Waiting to meet him was Iraq's new interior minister, Qasim al-Araji, who received the general with some pomp and a cluster of Iraqi television cameras. "We thank you for your support to the federal police during this operation," said Araji. "It does my heart good to see them moving so quickly," responded the American general. Outside, U.S. troops stationed at the base mingled with Iraqi police, while rockets fired by ISIS thudded intermittently nearby. American forces in Iraq do not fight on front lines, but they were wearing body armor and helmets. As coalition advisors have deployed closer to the battle, they have found themselves in harm's way, said the coalition's spokesman, Col. John Dorrian. American troops "have come under fire at different times, they have returned fire at different times, in and around Mosul," Dorrian told reporters Wednesday. At Townsend's next stop, a much smaller outpost also south of Mosul, American soldiers described how they try to help Iraqis defend themselves against ISIS's deadliest battlefield weapon: mobile car and truck bombs, which are often carefully hidden and which have been used in the hundreds. Staff Sgt. Sung Kim said usually an Iraqi liaison officer will pass on information that his men can see the car bomb moving toward them. "And we'll say, OK, so what direction? And they'll give it to us, and we'll immediately get the aircraft in the area," Kim said. The surveillance aircraft send images to a control center at this small base. "And we will search for it, and search for it, and search for it until we find it." Then, they can call in an airstrike to target the bomb — known in military jargon as a vehicle-borne improvised explosive device or VBIED. Out here, in wild, open countryside, it is clear Iraqis and Americans are working closely. "The Iraqis — they're hardened men," said Kim. "They've been through the same crap over and over and over again — and the more VBIEDs we can hit before they hit the Iraqis, the better." Americans and coalition partners are working with a range of Iraqi forces: local and national police, tribal fighters, the army, special forces. One body they do not yet assist directly is the one known as the Popular Mobilization. These fighters, which include hard-line Shiite Muslim forces designated as terrorists by the U.S., are now officially part of Iraqi's security forces. Many of them are deployed west of Mosul — and, said Townsend, they too are part of the fight against ISIS. They "absolutely are contributing positively to the fight," he said, noting that the fighters were following the orders of the prime minister and battlefield commanders. "They're doing what they've been instructed to do and they are doing it fairly well," he said. "And it's because of them that Mosul is cut off from the rest of Iraq and Syria." Townsend declined to discuss the new administration's strategy to defeat ISIS, and the effect of the — now blocked — executive order banning Iraqis and Syrians from traveling to the U.S. But he did pay tribute to American allies in those two countries, speaking of the sacrifices made by Iraqi security forces in east Mosul as they strove to avoid civilian casualties, and of the fact that the fight against ISIS is crucial to keeping the U.S. and the world safe. "That's what I think I would like the people of the West to know," the general said in the closing moments of an interview conducted in the back of a muddy pickup truck. "How important this fight is here, and that our Iraqi and Syrian partners are sacrificing not only for their own countries, but for the region and the rest of the world as well." In Iraq, security forces intensified the battle to take back the city of Mosul from ISIS. They've now pushed into the airport of the city. The U.S. has hundreds of troops in Mosul helping Iraqi forces against the extremists. NPR's Alice Fordham joined the top U.S. commander there to visit Iraqi and U.S. forces. ALICE FORDHAM, BYLINE: From the window of a Black Hawk, northern Iraq looks calm and bucolic, the city of Mosul, hunched on the horizon, showing no sign of the battle against ISIS raging there. But raging it is. And across from me in the helicopter is Lieutenant General Stephen Townsend, the American commander here as U.S. forces help Iraqi troops. FORDHAM: Our first stop is an Iraqi federal police base south of Mosul where Iraq's interior minister, Qasim al-Araji, is there to welcome him. FORDHAM: Araji thanks Townsend for U.S. help. His federal police are now alongside special forces fighting to take Mosul's airport. LIEUTENANT GENERAL STEPHEN TOWNSEND: It does my heart good to see them progressing so quickly. FORDHAM: Outside, prayer pours out of the mosque on the base as Iraqi police mill about with U.S. soldiers. There are about 450 advisers around Mosul, some American and others from other countries in the anti-ISIS coalition. ISIS rockets land near this base, and the soldiers are wearing armor and helmets. Americans aren't on the frontline, but they have come under fire and returned fire during the Mosul campaign. We head back to the helicopter and to a remote outpost, really just a couple small buildings and a cinderblock wall where Americans are partnered with the Iraqi army. 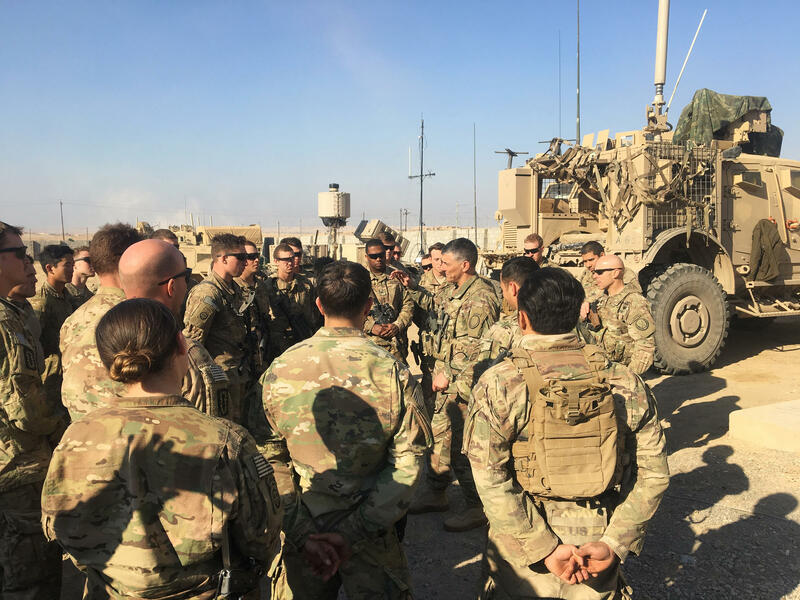 While Townsend pores over maps with an Iraqi general, I speak with U.S. Staff Sergeant Sung Kim about how the Americans here are helping the Iraqis deal with what's been a persistent threat, ISIS car bombs - in military jargon, VBIEDs. Kim says typically an Iraqi officer will alert him. STAFF SERGEANT SUNG KIM: He'll say, hey, my guys are tracking a VBIED supposed to be coming to their location, and we'll be like, OK, so what direction, you know? And they'll give it to us, and we'll go immediately, you know, get the aircraft in the area. FORDHAM: Those aircraft beam back images to a control room right here. Then they can hit the car bomb with an airstrike. ISIS has fought back hard around Mosul. In a significant shift in coalition tactics, U.S. and other troops have embedded deeper with Iraqi forces to help prevent casualties. With that in mind, I ask Kim how it feels when they're hunting for a suicide bomber driving toward Iraqis. KIM: I got to find it. That's all I got to do. I - you know, that's my mission. And I mean like I said, these Iraqis are - they're hardened men, you know? They've been through the same crap, you know, over and over and over again, you know? And the more VBIEDs we can hit before they hit the Iraqis, the better. FORDHAM: We head off again, and later Townsend tells me the fight for Mosul is only going to get tougher but that this battle his forces are helping with is crucial for the threat ISIS poses to the U.S. as well as the Middle East. TOWNSEND: But I think I'd like the people of the West to know how important this fight is here and that our Iraqi and Syrian partners are sacrificing not only for their own countries but for the region and the rest of the world as well. FORDHAM: Back in the U.S., President Trump has asked for a new plan to defeat ISIS. In Iraq, Townsend says after more than two years, ISIS still holds more than half the territory they've taken. Americans are deeply involved in the fight that is far from won. Alice Fordham, NPR News, northern Iraq. Transcript provided by NPR, Copyright NPR.